It's time for Challenge #287 at Little Red Wagon. It is Jan R's turn to choose our challenge theme and she wants us to use an item starting with the letter B. She is calling this week's challenge, B'LIEVE IT. 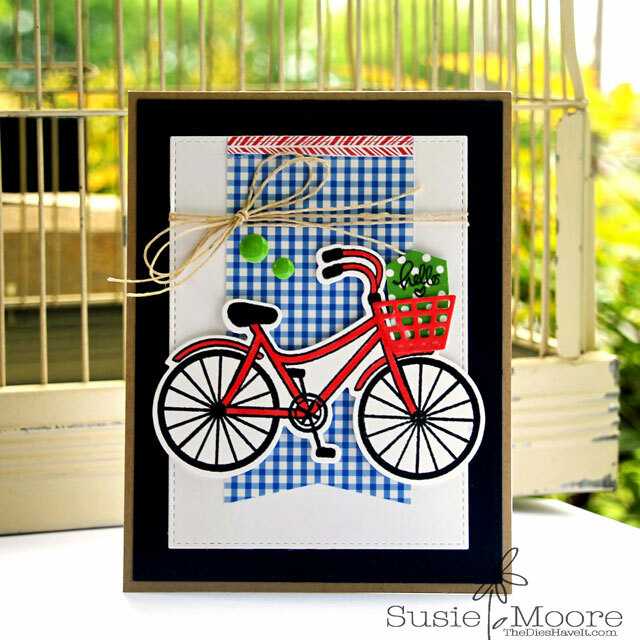 I made my card using the Bicycle2Stamp stamp set from The Stamps of Life. I also used the matching die. I needed something to pop into the basket, so I fashioned a tiny tag with "hello" stamped on it. This was a fun card to assemble from scraps laying on my table. I love when that happens! Be sure to check out what all the LRW Girlfriends have created this week. The links are to the right (and then scroll down a little) of this post. Once you have been totally inspired, be sure to create your project and link it up on the Little Red Wagon blog. I hope you'll play along with us this week! See you tomorrow. Until then, have a wonderful day!! Ooooh, loving the bold colours and the lovely bows. Fantastic card!